For maximum convenience, tyres were replaced at the owner’s workplace. Need a tyre straight away? 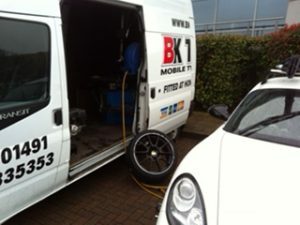 BK Tyres offer a same day mobile tyre fitting service. Perhaps you hit a pot hole on the way to work and noticed the tyre is flat. Or maybe the regular tyre dealer you were counting on is out of stock. Perhaps you’re selling the car and need to get it through the MOT in a hurry. Whatever the reason, if you need tyres fitted at home (or at work), give us a call on 01491 835353 (or 03331 234242 from a mobile). We would love to help. Our same day mobile tyre fitting service is subject to availability, but it’s always worth trying us. Often, we do have the capacity to meet your same-day needs. And as you can see from our testimonials, we always do a professional job. Prices of the same day mobile tyre fitting service may vary from our regular fitting fee – ask for details when you ring. Our same day tyre fitting in Oxfordshire covers the whole county, including Oxford, Abingdon and Didcot. We also offer same day tyre fitment throughout Buckinghamshire, including Aylesbury, High Wycombe and Marlow. In addition, our mobile same day tyre service covers Berkshire, including the towns of Reading, Slough and Bracknell.